Bear Grylls is the world's most famous explorer and survival expert. He is the star of many documentaries broadcast on French television channels and is the author of guides and manuals sold to about 6 million copies worldwide. With Knots and Dangers and emergencies, this is one of the Bear Grylls collections dedicated to adventure lovers that lands in France. Do you know stop, junction or loop nodes? What are the strongest and quickest things to do? In this richly illustrated book, Bear explains knots and survival skills to help explorers of all ages face the big or small traps of wilderness. The collection has no less than 20 titles to be published soon. 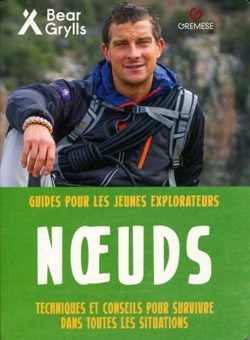 And that's not all: Gremese will publish other books signed Bear Grylls in which he tells us about his expeditions and adventures and offers books of activities. A beautiful editorial program dedicated to this television star!